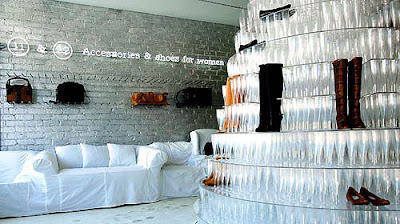 I was first drawn to this Beverly Hills boutique by the thousands of shiny plastic sequins covering the store. It was just so sparkly and pretty. But the true gem is what's inside. You will also find tailored classics, the limited-edition handmade Artisanal line, and white-coated Margiela staff. Martin Margiela, who took over the women's ready to wear at Hermes in 1996 before his line was bought by Diesel, continues his influential career and international development while presenting his Haute Couture line in Paris. Martin Margiela's second store in the U.S. is located at 9970 South Santa Monica Blvd in Beverly Hills. Call (310) 284-8093 or click the title link for more info. Or just ride by to see the sparkly sequined exterior.